Specially developed to fulfill the vehicle’s ‘Dual Concept’, the GX460’s powerful 4.6-liter V8 gasoline engine offers both extraordinarily smooth on-road performance and incredible torque for off-road driving. To achieve class-leading quietness and smoothness, Dual VVT-i (Variable Valve Timing-intelligent) varies intake and exhaust timing to increase torque, while significantly reducing exhaust emissions such as NOx (Nitrogen oxides) and HC (Hydrocarbons). Dual VVT-i, EGR (Exhaust Gas Recirculation)system and advanced low friction components combine to deliver higher output and torque than comparable 4.6-liter gasoline engines, with fuel economy similar to smaller 4.0-liter engines. For maximum SUV flexibility, a 6-speed automatic transmission offers fast linear acceleration, quiet high-speed cruising and excellent heavy-duty power. Lexus has always been committed to the concept of ‘jidoka’—the Japanese word for automation—with a human touch. This is exemplified by the GX460’s V8, in which precision-machined engine components are first meticulously cleaned and painstakingly scrutinized before assembly. Further quality control testing takes place to ensure the smooth running of the crankshaft beforehand assembly at our Tahara plant. To reduce the overall engine weight, the V8 cylinder block is die-cast in a lightweight yet strong aluminum alloy. Finally, each GX460 undergoes a demanding final track test. On paved roads the GX460 offers the smooth refinement of a Lexus sedan. This is mainly due to the ‘Body on Frame’ construction and the specially developed KDSS (Kinetic Dynamic Suspension System). This uses hydraulics to control the front and rear stabilizer bars, thus reducing body roll when cornering. In addition, double front wishbones and a four-link rigid rear axle work with AVS (Adaptive Variable Suspension system) to reduce roll even further by adjusting all four wheels independently. At speed, brakes are especially important for a vehicle of this size and weight. For this reason the GX460 is fitted with large ventilated front and rear disc brakes. For extra stopping power, the Brake Assist system also anticipates when additional braking force is needed. Steering precision is enhanced by VFC (Variable Flow Control). The GX460 chassis was developed so that drivers can travel off- or on-road with near equal composure. Featuring a high-tensile steel ‘Body on Frame’ chassis, it is extremely strong, and provides outstanding resistance to twisting forces no matter how uneven the terrain. The rigidity of the chassis means that you can drive over the roughest country, cross rivers, and even climb mountainsides. These challenges were all faced and mastered by GX460 prototypes, which were driven for 30,000 kilometers off-road through the Australian Outback, followed by 70,000 kilometers on potholed tracks. The GX460 is one of most capable 4WD vehicles ever built. At its heart is a full-time 4WD system that gives maximum traction on slippery surfaces like snow, mud and ice, while a rugged new TORSEN® LSD (Limited Slip Differential) automatically directs power to the wheels that need it most. In addition, to ensure that as many wheels as possible stay in contact with the ground, Lexus developed an electronically modulated KDSS (Kinetic Dynamic Suspension System). When driving off-road, KDSS virtually disconnects the front and rear stabilizer bars so each wheel can apply traction independently to cope with very rough terrain. 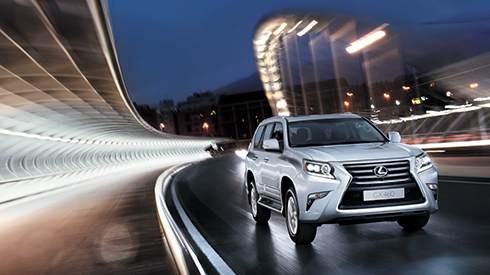 The GX460 SUV is fitted with very advanced traction and braking systems. When driving off-road, shifting into low range will immediately deliver even more control of torque and speed. For peerless command of wilderness conditions, Multi-terrain Select allows you to easily select the appropriate brake and accelerator settings for Mud & Sand, Loose Rock, Mogul or Rock. On steep gradients, Hill-start Assist Control ensures smooth hill starts by preventing rollback. When driving down steep inclines, Downhill Assist Control (Optional) automatically regulates all four brakes, helping to enable even slippery descents to be negotiated safely. Multi-terrain ABS (Anti-lock Brake System) with EBD (Electronic Brake force Distribution) is another GX460 breakthrough. It can identify loose surfaces, such as snow or gravel, and automatically adjusts the vehicle’s ABS braking characteristics to help you stop more quickly. No driver can look in four directions at once. So, to give the GX460 owner a near 360° view of what is going on around the vehicle, a Multi-terrain Monitor (Optional) displays up to six images from the front camera, left and right door mirror cameras (front and rear views) and rear camera. Camera selection is operated via a multi-information switch on the steering wheel, and is particularly useful for spotting large rocks or ruts next to the vehicle, or for looking down from the brow of a hill to see the view below that is normally obstructed by an SUV’s hood. Should any of the cameras spot an obstacle that is dangerously close to the vehicle, the clearance sonar device will immediately sound and show the area with the obstacle on the display.